As many of you know, or perhaps have heard through the grapevine, we are offering a wonderful DIY Photo Calendar kit as our Constant Campaign this December and if you haven't figured it out I could not be more excited!! 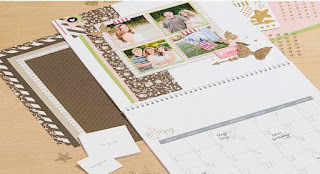 This kit is fabulous and has everything you need to make a complete 12 month photo calendar, with the spiral bound base!! I mean could it get any better?! Check out some of these layout designs. Gorgeous right?!! 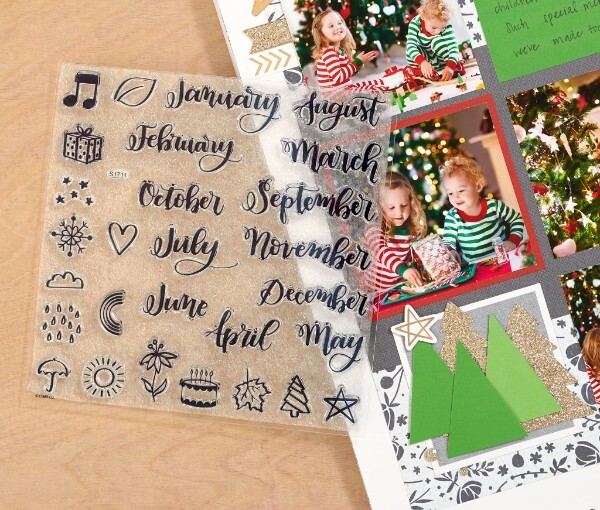 Each month features a unique 12" x 12" scrapbook page that highlights different seasons or holidays. Just add photos to remind you of your favorite memories throughout the next year! And the kit comes with the My Creations Calendar which is pre-assembled so there is no messing around with bindings. Ok so that's not the only thing that this kit comes with. This kit also includes the following. 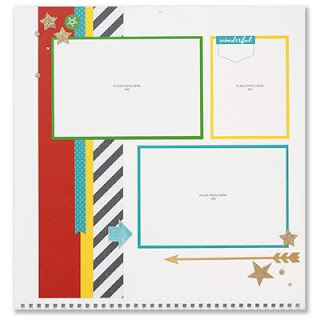 Use the materials in this kit to create a customized 12 month calendar. My Acrylix Through the Year Stamp Set not included . That's a lot of material right?! Especially when in December we are going to bundle it all for you to give you at a 20% Discount!! Don't you simply love bundling. Now the kit above at it's discounted price is $38.95. One thing you may have noticed from the above kit contents list is that this bundle does not give you the $5.00 stamp set that you need to complete the calendar. It looks like this. You may have seen it around lately? 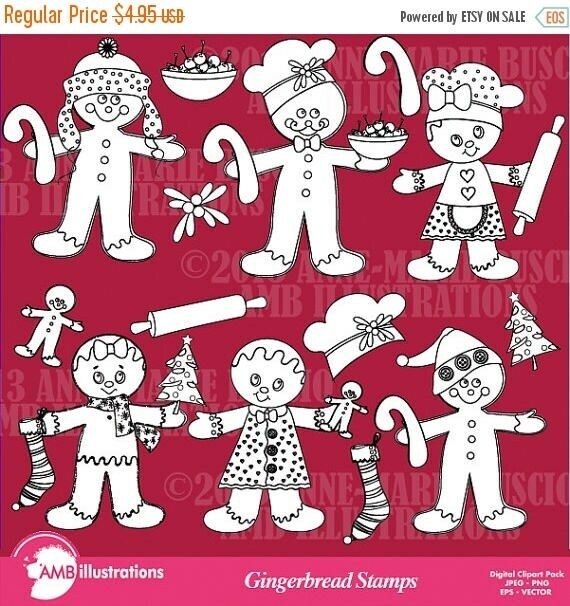 Well if you haven't this stamp set is actually a set of 28 and is out Stamp of the Month for November. 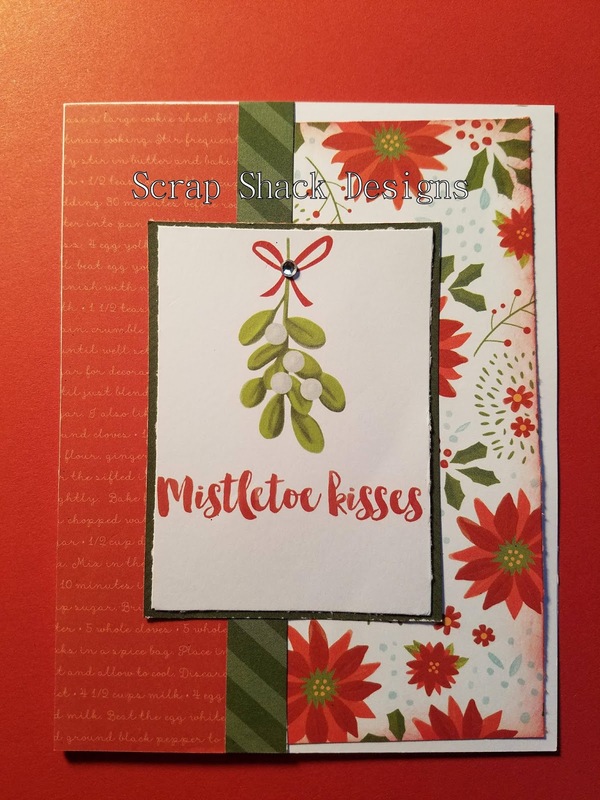 So sneaky, sneaky, savings... if you purchase a kit from me in the month of November then I will discount your bundle and give you an additional stamp set. 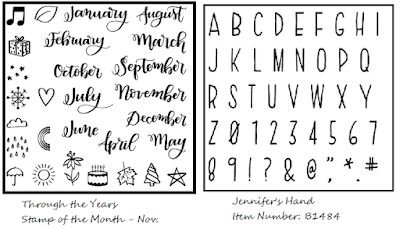 So you will get this month's SOTM as well as Jennifer's Hand, which is a B Size Alpha stamp set that will help you complete the calendar project. This kit will also include everything the above kit offers except it will add the two additional stamp sets. You will also be entered into the running for my Nov. prize for ordering from my website. This kit will be $53.90 and these two stamps look like this. Then finally, see I told you there were 3 ways to save, if you happen to miss the November deadline but love this idea (I mean who doesn't love photo calendars!) 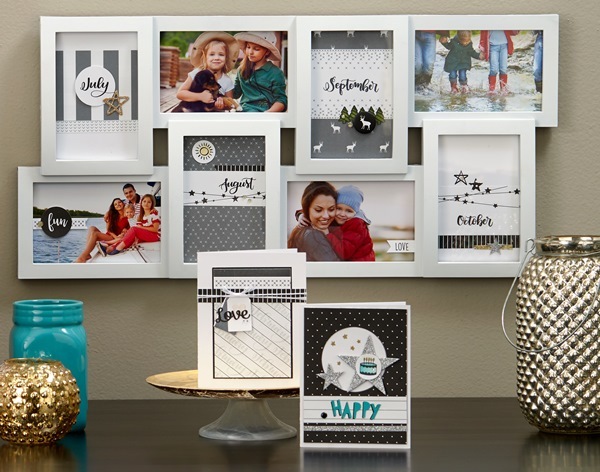 you can purchase a kit with the "Through the Years" stamp set for a reduced price. This kit will include everything the original kit offers plus the stamp set and will be offered at $56.90. Ok, ok, ok... because I enjoy your company so much I am going to give you another way to save even more. For Hostess: When you host a party that reaches the fourth level of Hostess Rewards or higher (submitting your party order no later than January 5, 2018), you’ll receive a FREE Through the Year Calendar Kit —that’s a $50.02 value, totally free! For New Consultants: Anyone who joins my team in December will receive a FREE Through the Year Calendar Kit in their New Consultant Kit— that’s a $50.02 value, totally free! December is a great time of year to think about your Christmas gift list. 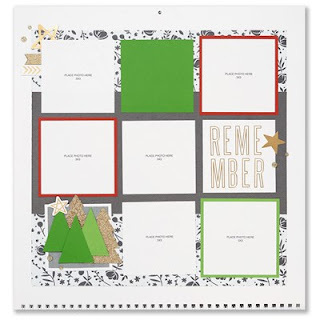 The Through the Year Calendar Kit can help you and your loved ones share a thoughtful papercrafting gift this holiday season! 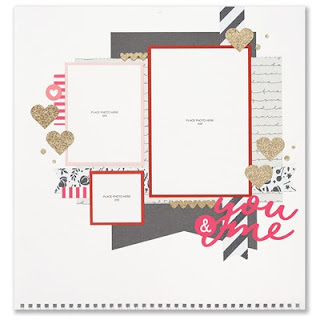 Whether you make it for yourself, for someone else, or both, the Through the Year Calendar Kit is an excellent way to get ready for the year ahead! Many of you know by know that CTMH offers two separate holiday paper lines, the Beary Christmas Line as well as the Silver and Gold Line. I wanted to come on and show you a great way to mix and match the two lines, you know for when you reach that point in December when you are running low on both lines but still have the crafting bug laying around. 1.) Look for a common theme in your layout or among your photos. Are you creating a page about a visit with your new niece, or perhaps that picnic outside at the park that one day. 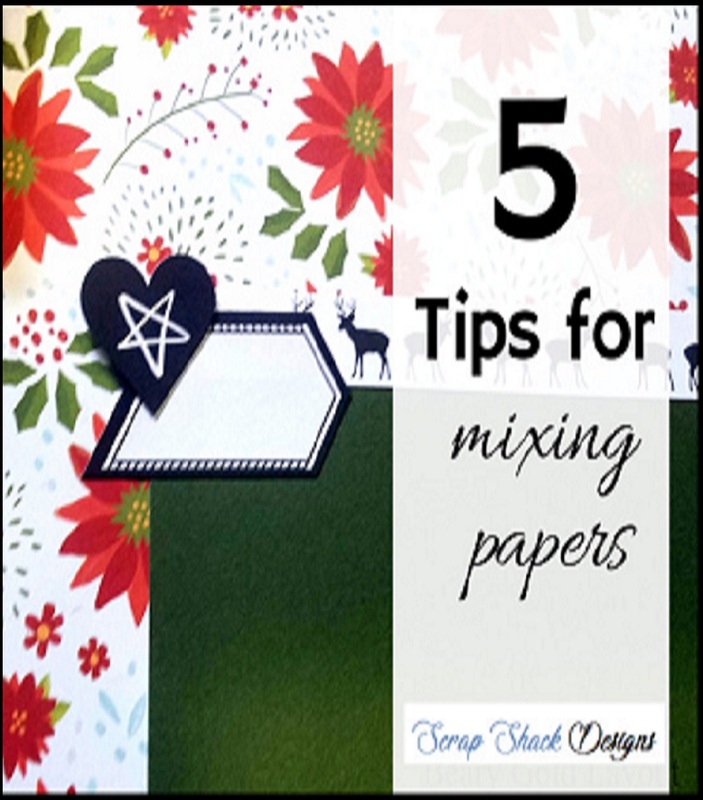 Whatever your theme is stick to it and pull it out through your papers. themed they ended up pairing well together. 2. 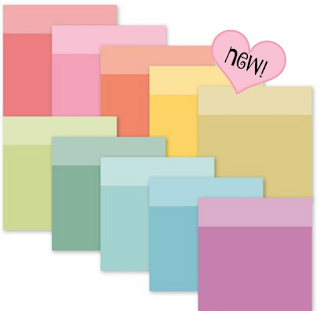 Stick with one of our Paper Packs and rest assure that every paper will match every other paper...no questions asked. We have already done the work for you and hired designers to make sure that each pattern and each color will match perfectly no matter what you try to do. We have even taken it a step further and paired our paper lines up with exclusive complement packs. 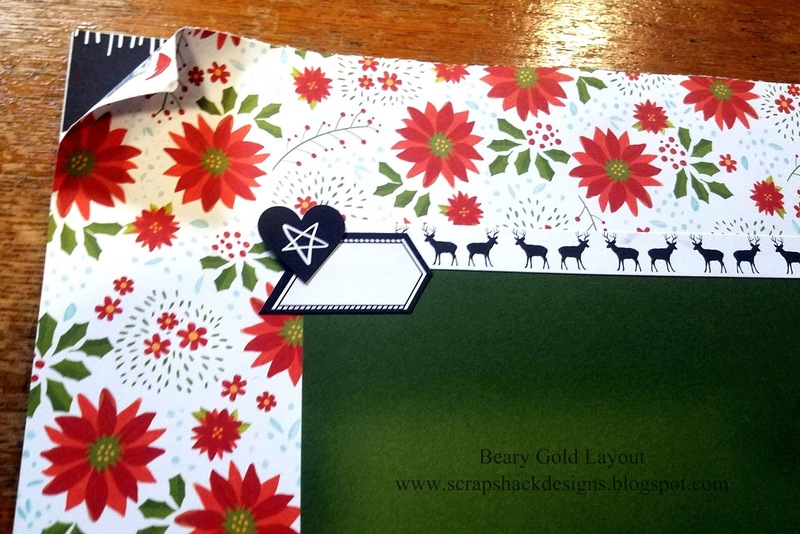 All three of my pattern paper pieces, in this layout, came straight from the Beary Christmas paper line, so I knew that no matter which of the 6 patterns I chose to use they would match perfectly every time. 3. To create an interesting contrast, mix bold patterns along with more subtle patterns. As shown in my layout I mixed a very bold background with more subtle patterns on the bottom. This provides the eyes with a resting point and makes sure that the layout is not to subtle or too busy. Remember, 60/30/10 rule where one dominate pattern takes up 60% of the design. and it really pulled that whole layer into the page mixture. 4.) Layer & Mat Everything! !..ok well not everything but do make sure to add in pops of a neutral color to provide a break from all the patterns. Typically your mat color can be pulled right from one of your pattern papers. 5.) Mixing up your pattern papers, or your paper lines in general, does not have to be a daunting task. 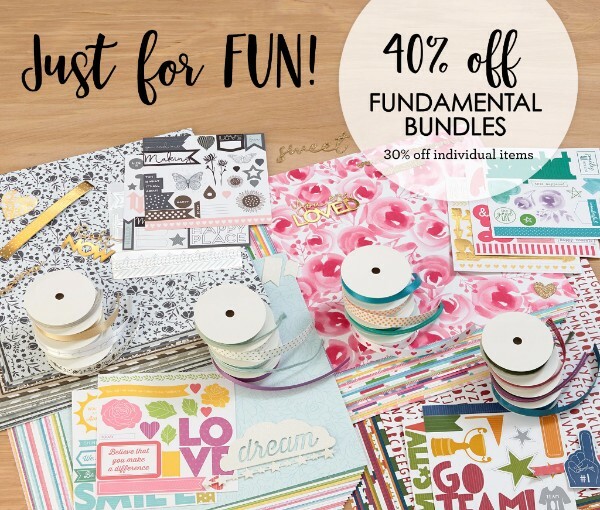 If you are new to paper crafting, or simply enjoy the craft more than the design work, then purchase a kit and play around with the papers. Before you know if you will be so good that you will be able to tackle all of your stashed papers. Let's challenge ourselves this week to get out those papers that we have been hoarding and let's create something using at least 2 different patterns. Then when you have that created come on over and share it with us in the Lounge. Hi guys. I'm here with a really quick and fun ink shading technique. Now as many of you know I've done a lot of different background techniques and this one is very similar to the cloud one where you use a stencil to create the background. These different shading techniques are really fun when paired with the just-for-fun stands can I highly recommend if you're new to it just getting a couple of different tools and playing around with them. 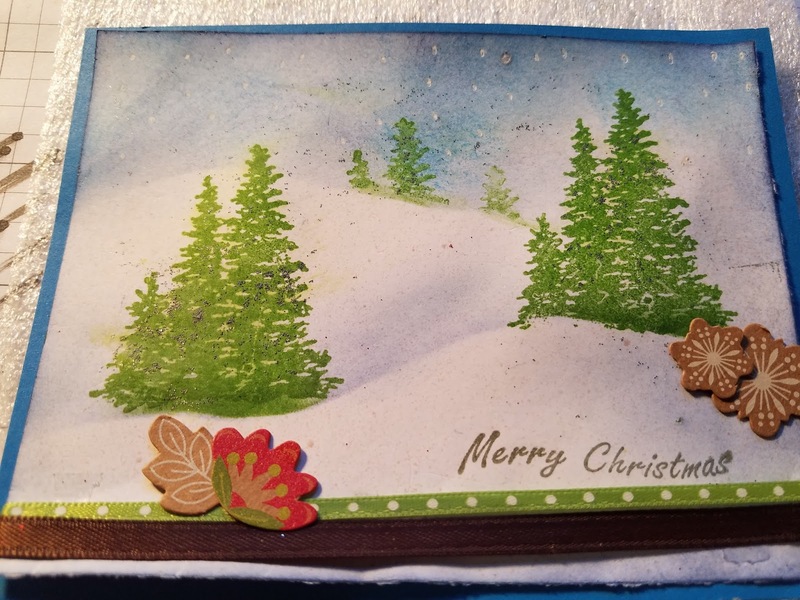 Now for this card I simply took a Sapphire and a Pacifica Inc as well as a Tim Holtz sponge Dauber. A lot of times I will get asked on how exactly you're supposed to sponge and I don't know if there's any true technique however the one that's always worked for me is to dab across your area and then when you go to add color in dab your sponge in the ink, then sponge onto scrap paper, and then for your second layer come back onto your paper with circular motions. 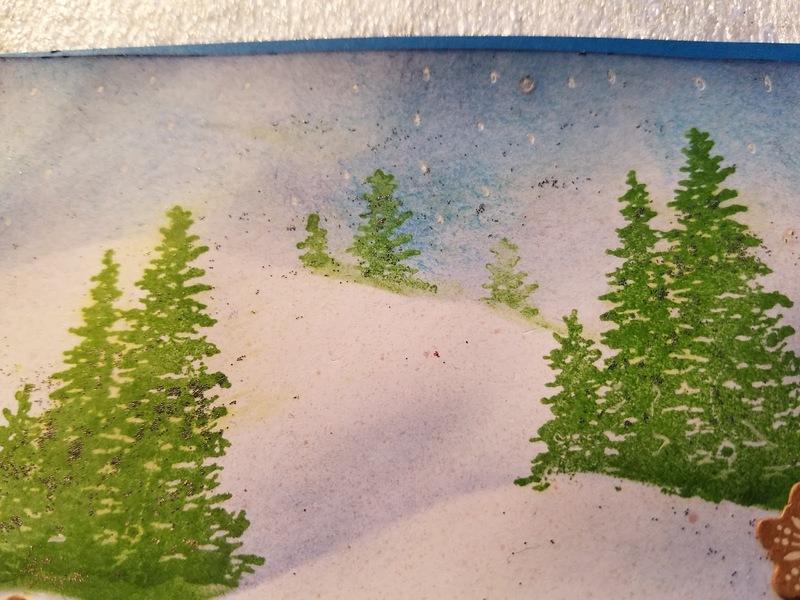 To achieve the look of snow hills I simply cut out a scrap piece of paper with a wavy border and used that to block my Ink and create the White hills. Start with the top hill and then add the second hill below it making sure to only Ink the top of your stencil not the entire area. Notice how the middle of my hill is still white. Those trees are from Just For Fun and are called Evergreen. JFF has a number of wonderful stamps that would work well with this technique and I cannot wait to try it with some other ones. 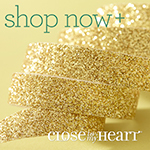 Being a Close to My Heart consultant is so much more than simply getting fabulous products at a great price (!!) but it's also about teaching such wonderful techniques and tips to such beautiful people. Today I wanted to share a video that inspired me this week. Stay tuned this week for more inspiration using this awesome technique. I will pair it with Jut For Fun Stamps on Monday and then show off some scrapbooking pages along with some great techniques for pairing up papers. 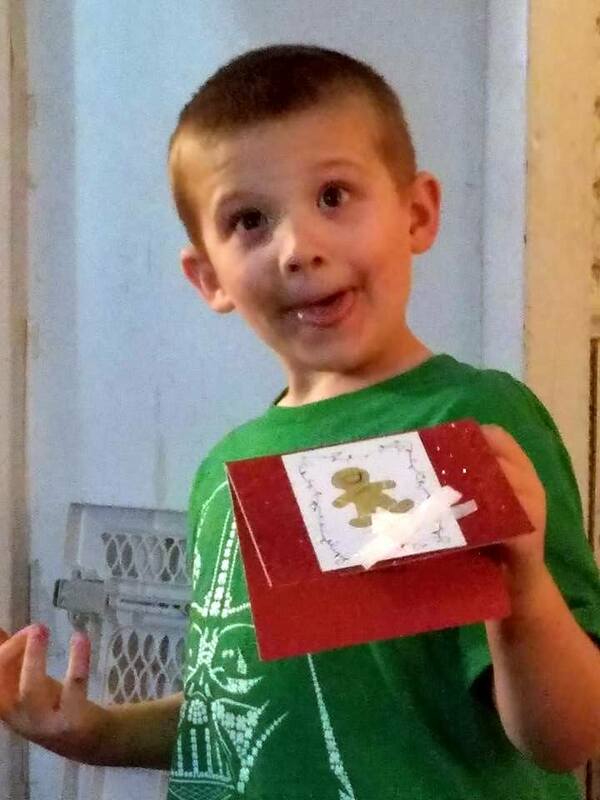 Remember how last week my son and I created holiday cards? Well if you have forgotten or simply would like some more inspiration then hop on over and read this blog post. Meanwhile, my project for today is a creation of that event and could also be duplicated really easy. 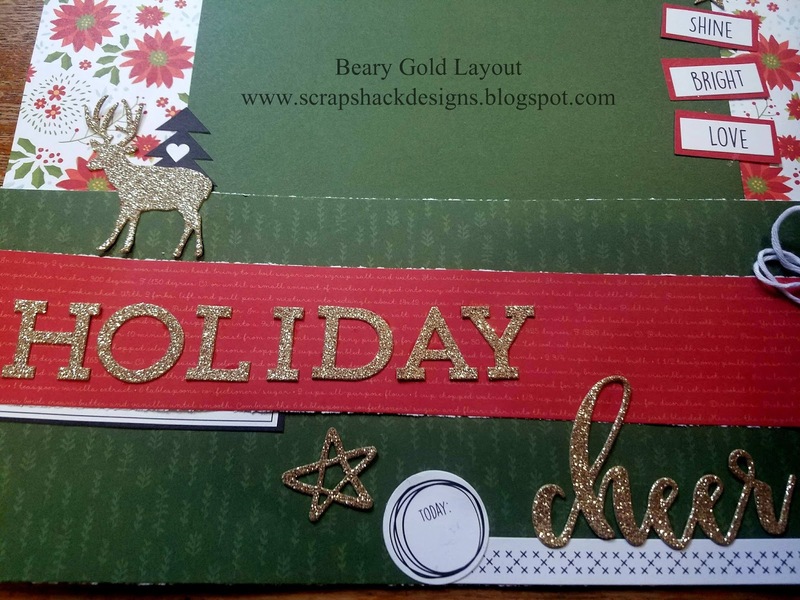 We were also playing around with the super traditional Beary Christmas paper line and PML cards. 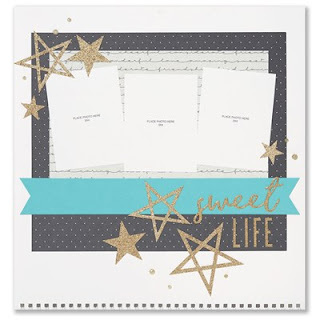 I highly recommend PML (pocket cards) for a number of reasons from their ease of use for all age levels to their quick/mess free scrapbooking uses. 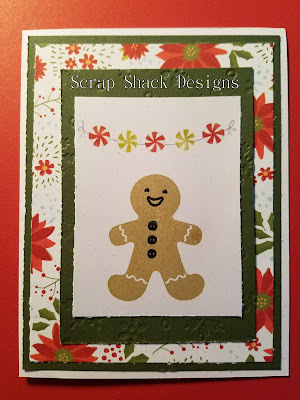 For this card we simply stamped a gingerbread man onto the PML card. 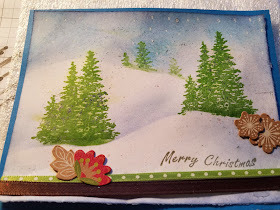 Then we layered that onto of a dry embossed (super fun and easy technique) layer. The embossing gives the card a little something special to stand out against the pattern paper. Today I was really inspired by a gold glitter tree line die-cut that I found in my embellishments and I knew that the perfect stamp would be the Joy Evergreen one from Just For Fun. 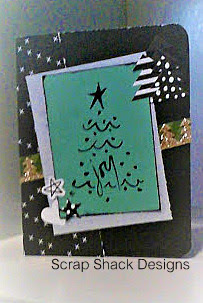 Now this stamp is a double sided stamp that I picked out because of all of the possibilities that the solid evergreen stamp has, well wouldn't you know that I was actually inspired by the inside/wording layer. Here are what both sides of that stamp look like. They would be spectacular paired up together or as independent stamps like I have done. Then I paired this stamp with some "Silver and Gold" paper and some matching stickers. Who could resist that glitter matched with the black and white! Plus the shape of the tree stamp with those matching tree stickers fit perfectly. Both JFF and CTMH can be a really fun company to work with you just have to find your style. Something new that I have been into lately, is inking...which BTW is perfect for JFF stamps!! For this project I inked around the top layer which helps that stamped image stand out. My papers were layered off center to give the card more character...again playing into the playful theme of the card. Thanks for stopping in today I hope you were inspired to Ge t Crafty! 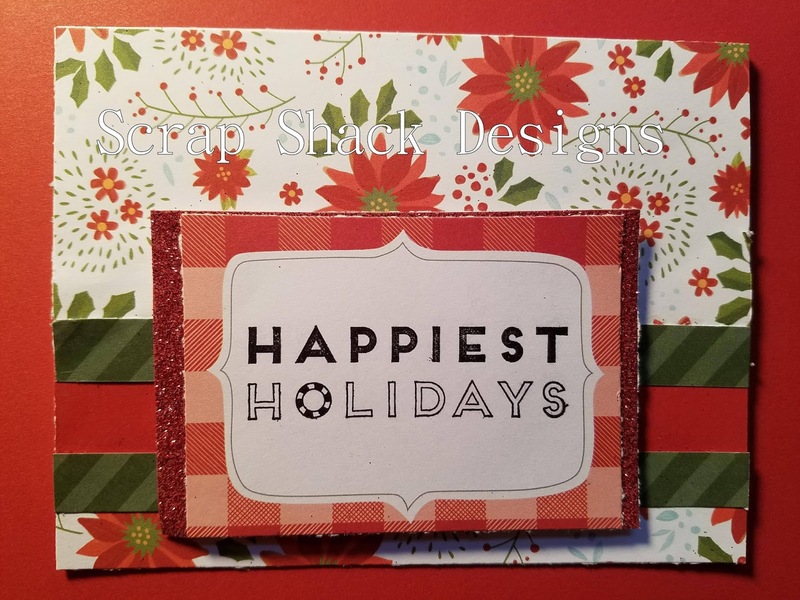 Today marks a brand new challenge over at Creative Knockouts where this week we are showing off our projects that have a border. 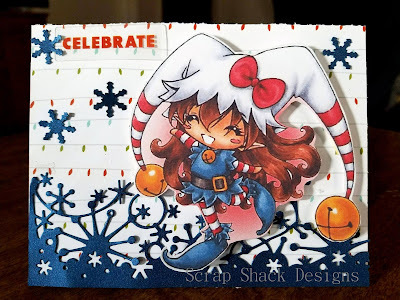 This was a really fun challenge for me because the image that I choose was really cute and matched my die cut border perfectly. The image I used came from Make It Crafty and I paired it with the Beary Christmas line and some die cuts that I received in a mail swap. Isn't she just the cutest?! Make it Crafty has a whole bunch of really cute digi's so hop on over there and check them out. If you interested in playing along with our new challenge or checking out what the other DT members created you can view our CK blog here. Thanks for stopping by today. I recently fell in love with the Beary Christmas paper line from CTMH, no surprise there right?! Anyway I ended up picking up the paper line along with the PML pack and I decided that would be plenty of product to make some really nice holiday cards and tags and so that's kind of what I am here to show off today. He's also a ham and loves to make silly faces for the camera. Plus, by getting this awesome stamp set in November, you'll be ready to make the Through the Year Calendar Kit coming out next month! Watch your inbox for more details to come next month! Thank you for reading! If you'd like to learn more about anything featured in this mailing, or if you have any questions, feel free to contact me.